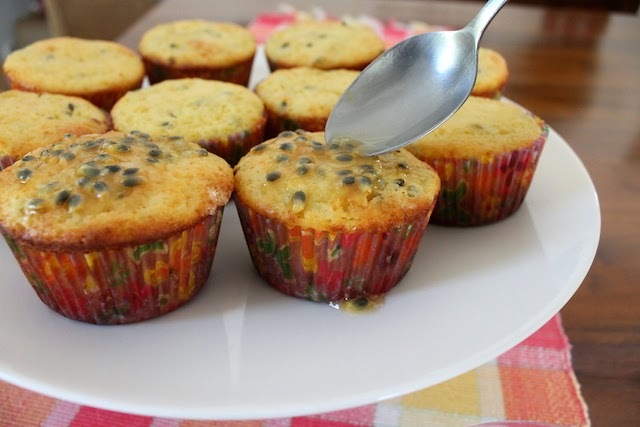 Many passion fruit recipes suggest that you strain out the seeds but I happen to like the pop and crunch they add to a dish, dessert or baked good. I am delighted to share that they are also reported to be a nutritious addition, adding fiber, antioxidants and magnesium to a healthy diet. Although I spent some time in tropical climes when I was a child, passion fruit only reached my consciousness when I moved to Brazil as an adult. There it is called maracujá and features in many desserts, especially the local favorite, ubiquitous at every restaurant and house party, mousse de maracujá. It occurs to me that I’ve never posted that recipe here and perhaps I need to rectify that. 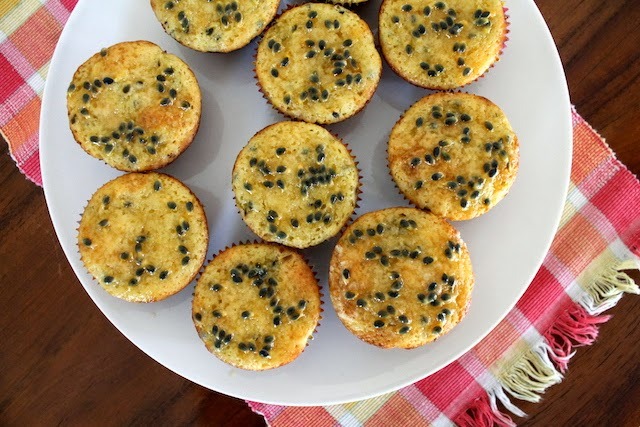 Meanwhile, since my local grocery stores are filled with passion fruit at reasonable prices, and since it is Muffin Monday, I put them in beautiful, flavorful muffins. I think they would be great for the upcoming Holy Week, the week before Easter, which commemorates the passion of Christ. Maybe I can start a new worldwide tradition of baking passion fruit muffins in addition to hot cross buns. Anybody else game to join me? Optional glaze – passion fruit pulp from two small passion fruit (1/8 cup or 30g) plus an equal amount of powdered sugar (1/4 cup or 30g) and small pinch of salt. In a large bowl mix together your flour, sugar, baking powder and salt. In a smaller bowl, whisk your milk, eggs and melted butter, along with the passion fruit pulp. Meanwhile, make the glaze, if using. Mix all three ingredients together in a small bowl, until all the sugar has dissolved. Remove the muffins from the oven and allow to cool for a few minutes. When the muffins are completely cooled, carefully spoon the glaze over the tops. It will soak in and make the muffins even more moist. And here I was thinking it was an Australian thing to like them because a girlfriend of mine and her daughter both love eating the seeds. It drives her French husband absolutely spare just to listen to them crunch. :) Like fingernails on the blackboard to him. You can certainly strain them out, Laura, and you won't hurt my feeling at all! That's how I feel, Betsy, plus I just like the way they look. Somehow they don't offend me like grape seeds do. I have to remove those when I am eating grapes. They taste bitter when I chew them. While these muffins look and sound delicious, I (language person) am still all hung up on the idea of passionfruit muffins for Holy Week. I just love that. We'll be in Vietnam for Easter, so unless I get my baking on shortly before we leave (unlikely) these will have to be bookmarked for next year. But I still love, love, the idea! I also wanted to let you know that I brought your banana-walnut muffins to a brunch last weekend. It was hosted by a colleague from the German school where I teach, and MrL and I were the lone Americans. Everyone was intrigued by the whole idea of bananas in bread form and many had never eaten banana bread - they were a huge hit, although the whole concept of a sweet bread was clearly a paradigm shift for most of them! Thank you, Carolyne! I debated about whether to add that connection but I thought it might resonate with someone. Where are you going in Vietnam? We've been a few times, while living in KL, and Hanoi is my favorite city. Lots of old history there. Now here I was thinking that banana bread is enjoyed the world over but then I remember that when we lived in Paris, bananas were on a special table in the neighborhood grocery store's fresh fruit and veg section called Les Fruits Exotiques. It made me smile every time I went in. I am glad your colleagues enjoyed the muffins. I don't know why more people don't bring bread or muffins to a potluck instead of the ubiquitous pasta salad. They are always well received. Me! I want to join you! I've never eaten a hot cross bun (I want to try it this year but I don't think I'll be able to before Easter) and I'd be totally on board with making passion fruit muffins a staple for this time of year. These look amazing! 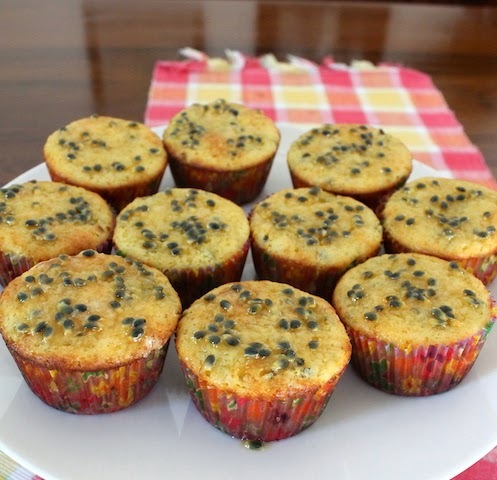 I can just imagine how JUICY these muffins with me, full of that lovely, tropical flavour. you know, I have always taken out the seeds if I have made anything with them but this time I won't! These look so pretty and tasty!